Orange County Fire Rescue recently placed Truck 30 into service and retired the former unit to serve the growing population and visitors of west Orange County. A dedication ceremony was held at Orange County Fire Rescue Station 30 in January to announce the service of the new front run Fire Rescue truck. More importantly, the ceremony remembered the life of fallen firefighter Carl Andriano, who lost his life to cancer at the young age of 24 on February 8, 2014. 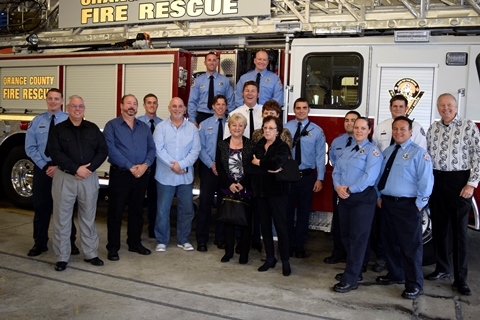 The intimate ceremony included Station 30’s first shift crew members, senior management and Andriano’s family members. Andriano was an Orange County Fire Rescue Honorary Lieutenant who was assigned to Station 30 until he could no longer work as a result of his life-threatening diagnosis. The ceremony began with an invocation and opening remarks from Orange County Fire Chief Otto Drozd III. Truck 30 is equipped with a 95-inch aerial platform that holds 300 gallons of water for suppression efforts. The unit is also designed to support other specialty rescues such as high angle and rope rescue. This is one of eight aerial units that service Orange County. In honor of Andriano, a custom plaque is mounted on Truck 30 that includes a powerful message – 30 STRONG. The retired unit was originally placed into service in January 2004. It ran 18,836 calls for service, including 9,656 Emergency Medical Service (EMS) and 9,180 Fire Rescue calls during its tenure.